This past Sunday I ran the inaugural Pleasanton Half Marathon – which happened to also be my “inaugural” half marathon as well. When I saw the ad for the race, I thought it would be cool to make it my first. The race benefited the Pleasanton Partnerships in Education (PPIE), a community organization that supports local public schools. They also held a 5k “fund” run that started about 30 minutes after the half marathon – it looked like there were quite a few participants in that race as well. 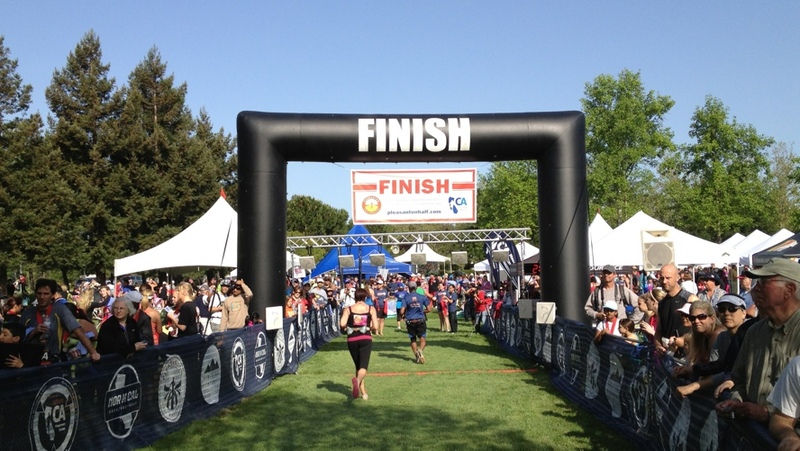 The event is part of the California Running series, which includes two other events: The NORCAL Marathon & Half and the Morgan Hill Marathon & Half. 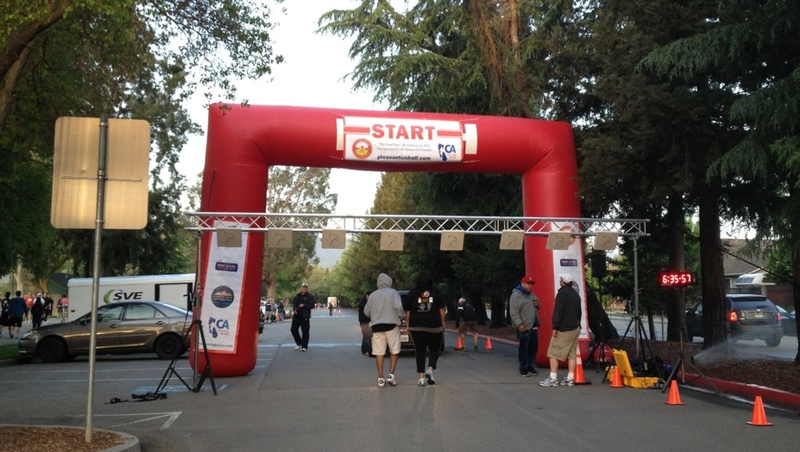 The course was a flat one that looped through several sections of Pleasanton, including neighborhoods, industrial areas, a portion of the Alameda County Fairgrounds, part of their downtown, and about 4 miles of trails. The course was well marked and there was plenty of volunteers and police to control traffic and manage the course. Some of the community even turned out to cheer! The weather was excellent. The post-race expo was really nice, hosting a variety of vendors, other organizations, and food. My favorite SWAG item was the free samples of Wrips Wipes. They actually work pretty good and I ended up buying a box. They had a band playing and people hung out for a while enjoying the weather and community. All in all, a great inaugural event and one that I think will grow in popularity. 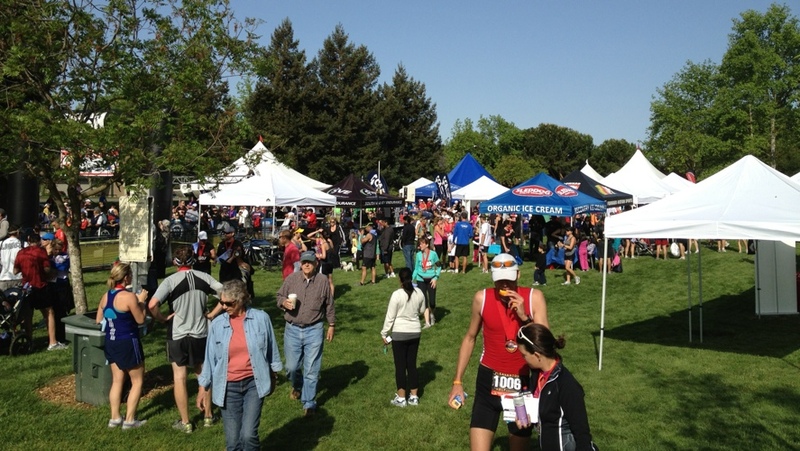 Hats off to the Racemine, South Valley Endurance, the City of Pleasanton, and the tons of volunteers who made the event a great success. Garmin time: 1:47:25 at an 8:11/mile pace. Official time: 1:47:21 at an 8:11/mile pace. Being my first official half, I was not sure what to expect as far as my race. My long run training is at or better than 13.1 miles, but not a “race” and certainly not with 1600 other people. That said, I planned this race out: tapering, pre-race carbing, mid-race fueling, and pacing. I beat my race goal time by 2:13 and pacing goal by :11, so I must have done something right! Pacing. I planned my pace goal using the McMillan Pace Calculator and my time from the Presidio 10 Mile. Knowing that the course was flat, I stuck with the goal and didn’t compensate for hills. I then used the Pace Band Calculator at races2remember.com, choosing the “Warm-up Strategy” option. 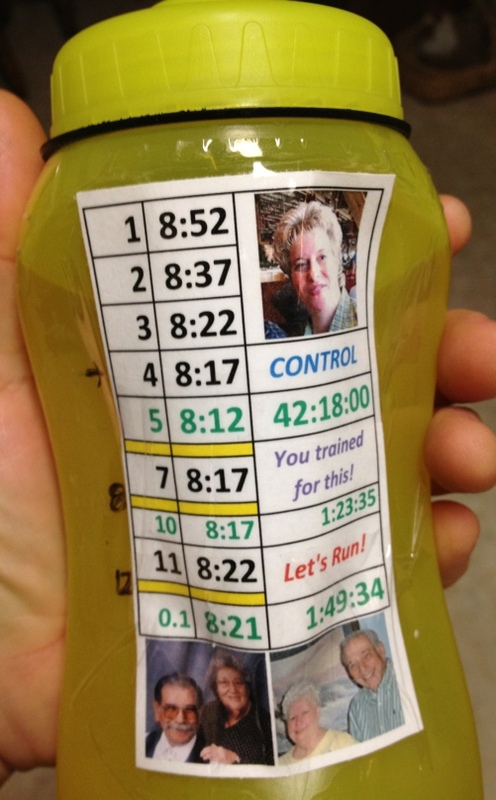 I copied the pacing to a spreadsheet and, as I did for the Presidio, I taped the plan to my water bottle – along with some other encouraging words and images. I tried to stick to the pace, knowing that I’d get tired later in the race; but, as you can see below, I still ended up fast at the beginning, miles 6, 7, & 11 – something to work on. I was fast on mile 13, but that’s OK – it’s the end and I was pumped! Tapering. I haven’t formally tapered before any other races to the extent I did for this one – not that I’ve done a ton of races anyway. I think it’s mostly because of the distances. My longest “race” prior to this one was the Presidio 10 mile and for that one, as typical for other races, I simply rested the day before. 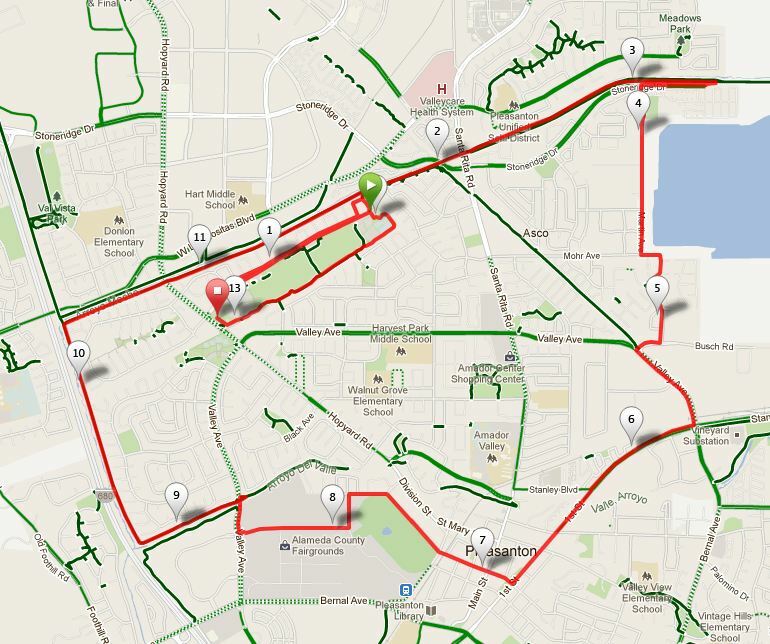 For this race, I reduced mileage the preceding Tuesday through Friday, running 5, 4, 3, and 2 miles – resting on Saturday. Carb Loading and Mid-Race Fueling. I was pretty intentional about these two areas for the first time – not that I’ve been doing this for an extended length of time – but for my other races and long runs haven’t focused on this area. I recently read a few articles about these two topics, as well as reading and re-reading Hal Higdon’s book, Marathon: The Ultimate Training Guide: Advice, Plans, and Programs for Half and Full Marathons.” I figured I’d test the strategies out and they seemed to have worked for me. On carb loading, along with info from Higdon’s book, I used the resource that was mentioned in a Runner’s World article called “The Endurance Calculator.” It was developed by a med student who bonked and wanted to know why and how to prevent it. Based on the calculator (which gives results for a marathon), I developed a plan for carb loading 36 hours ahead of the race. I basically switched to mostly carbs for two days – 88% and 85% respectively (~75% the day prior) – increasing my caloric intake by about 550 calories each day. On mid-race fueling, I also recently read a few articles and got some advice from a friend in this area. Based on those, I strategically planned out my GU Gel and Electrolyte Brew consumption pre and mid race to keep glycogen levels up. 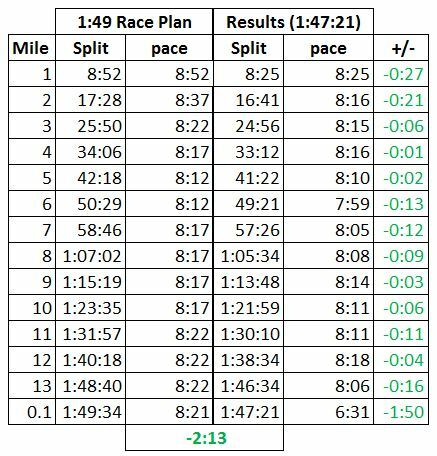 I ate two GU gels prior to the race (-:45 & -:15) and the three during (at miles 4, 8 & 12) [about 125g of carbs] and drank ~24 oz. of GU Brew as well [39g of carbs] – about 650 calories. Overall. I know there is science involved here (the combination of tapering, higher carb intake, pace planning, and mid-race fueling), but some people don’t do either of these things and do just fine. Given that, it seemed to work for me – especially when I compare how I felt at the 10-mile marks for the half marathon and the Presidio 10: huge difference. The end result was that my overall pace and post-race “condition” was better for the 13.1-miler than the 10-miler. I was starting to tire at about mile 12.5 in the half, but I’ll stick with this program. I didn’t reach a “bonk” or wall stage and was able to manage a nice kick the last 1.1 miles. So, my first half marathon is in the books! It was a great experience and one that had several “learns” – which is something that seems to happen each time a run a race.